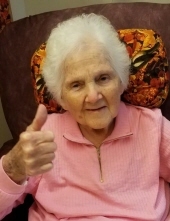 Violet A. Butler, age 91, of Oshkosh, WI, passed away on Tuesday, January 15, 2019, at the Aurora Medical Center in Oshkosh. Violet was born on December 30, 1927 in Tomahawk, WI, to the late Louis and Pauline (Schydlocki) Copiskey. Violet attended St. Mary’s Catholic Grade School and Tomahawk High School. She later received her CNA Certification in Milwaukee where she worked at various hospitals and nursing homes. In 1976, she moved back to Tomahawk and was employed at Golden Age Nursing Home and later Harley-Davidson. Violet spent her life caring for others and demonstrated true kindness and compassion to family and friends. She enjoyed rummage sales, gardening, and playing bingo. She was a talented cook who wouldn't let anybody leave her house hungry. 1 Sister, Joyce Rosiak, of Kenosha, WI. Violet is further survived by many Grandchildren, Great-Grandchildren, and Great-Great Grandchildren. She was preceded in death by her Parents, Louis and Pauline; her First Husband, George; her Second Husband, Lawrence; 2 Sons, Michael and Richard; her Brothers, Sisters, and Sister-in-Law; and her loving cat, Kiki. Funeral Services for Violet Butler will be held on Saturday, January 26, 2019, at 2:00 PM, at Generations Funeral Home. The family will receive friends for Visitation from 12 Noon until the time of Services at 2:00 PM. Interment will be held at Calvary Cemetery in the spring. Memorials are appreciated to the Lincoln County Humane Society. To send flowers or a remembrance gift to the family of Violet A. Butler, please visit our Tribute Store. "Email Address" would like to share the life celebration of Violet A. Butler. Click on the "link" to go to share a favorite memory or leave a condolence message for the family.